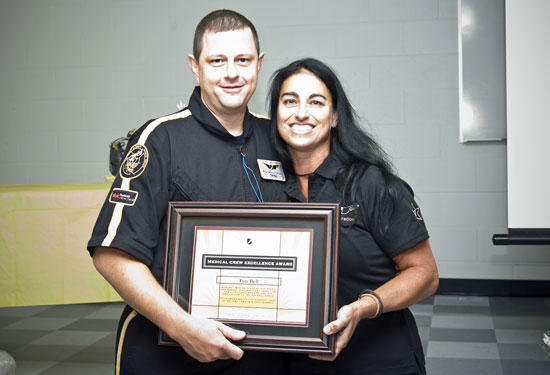 Tim Bell, Critical Care Flight Paramedic and Respiratory Therapist for Vanderbilt Lifeflight, has been honored by his colleagues as the 2012 recipient of the MEDICAL CREW EXCELLENCE AWARD. Tim was selected for making a significant impact in the Lifeflight Program through his demonstration of the highest level of patient care in a safe manner. So Well Deserved. Tim you are a wonderful and caring individual. May God continue to use your hands in his work for the community. Long work hours and long hours training do get noticed....Good job Tim. I'm proud of you and proud for you----You know I'm a fan. Way to go Tim well deserved!!! It's nice to see good people get recognized for their good deeds! Another success story from Cannon County! Congrats Tim!! Congrats! I am so happy for you. You always was a hard worker when you were at the ambulance department when I worked as a 911 dispatcher. I enjoyed those days. And now you have shown how dedicated you are in the caring of others. Keep up the hard work, as you can see it does get appreciated. So proud! Way to go , Tim. You make me so proud to have known you. Congratulations Tim! We wish you continued success and many safe journeys ahead. Thank you for this valuable work.